LEAVENWORTH — College is an ideal place for students to further their skills in a sport, whether it be football, volleyball or track. But there is a new kind of sport that is rapidly growing across the United States, and the University of Saint Mary in Leavenworth has joined its ranks — eSports. ESports is competitive video gaming at college and professional levels, where individuals and teams compete in battle video games such as League of Legends and Fortnite. But it also promised to interest prospective students, too, filling a need that many colleges haven’t even identified yet. “ESports opportunities are growing, but there are certainly still a majority of colleges without them,” said Shultz. Varsity-level collegiate eSports programs began in 2014 at Robert Morris University in Chicago. There are currently 125 different programs in the United States, according to the ESPN official website. The USM eSports team officially launched in November 2018, making it the third in Kansas. Now, the 12 members of the team are spending Tuesday and Thursday evenings practicing in their newly renovated facility in USM’s Mead Hall, which was completed in March. “What I’m enjoying about it so far,” Schultz said, “is not just that we have so many students already who are participating in it, but just the students who are walking by and watching and looking and appreciating the facility and our future for it. Like any sport, the team goes over strategies and pregame analytics of opponents and studies footage after a game. ESports head coach Drew Boehm also gives suggestions throughout a game. Gamers then enter tournaments to test their skills. “The way it works on the collegiate scene is there are various tournaments that are hosted by third-party organizations like Tespa, Collegiate Starleague and Midwest eSports,” Boehm said. “So, basically, there will be open registration and you send in all the paperwork and forms,” he continued. “They verify that the students are in fact college students, and that they go to this school. Then they’ll seed you based on rankings if the game does have a ranking system, or they build random teams. Unlike other college sports, eSports has a perk when competing in tournaments — money. “It is really neat because basically every other sport in universities [has] a lot of regulations and rules where they can’t do things for money,” he added. “But with this, because of the fact that it is hosted by these third parties, there is no real mass governing bodies because they make the game. Financial incentive is not the only perk to being a member of the team, Boehm said. “You learn how to think critically, and you have to think really quickly in these games,” Boehm said. “You work as a team and learn how to take constructive criticism, and think on a different level than you normally would. “What is really cool is a lot of these guys didn’t know each other really at all in early December. Now, it is almost like everyone is best friends. “That is something I’ve always liked about this stuff. I have friends that I’ve never met in real life, but I know really well just because I’ve played with them [online],” he said. “It is like that, but amplified, because you play these games together — which is already a bonding experience because it is often their favorite game. USM freshman Adrian Esparza, a self-proclaimed introvert, said being on the team has helped him meet people. “They are all really cool people. It is like I can get out of my bubble and meet people, and it is a common interest, so I’ll always have something to talk about with them,” Esparza said. Unlike other college sports, any full-time student enrolled at USM from undergrad to graduate can play on the team — which was important to USM senior Meshach Adams. 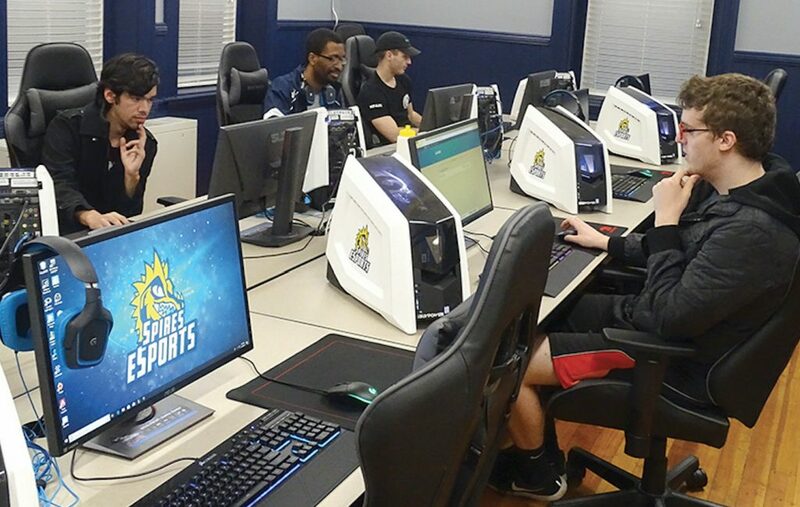 For more information about USM eSports, go online to: www.gospires.com and click on “Sports” for the drop-down menu listing all the sports available at the university.